Every six months or so we have a shift bid at my work and then re-align the teams (representatives and managers) to each other based on the bid results. This last week I got a new team and have slowly been getting to know them. I love this time because I always find out that many of them are Christians!Of course, in my experience after having hundreds of people reporting to me, almost everyone is a Christian. Which explains world peace and how no one is hungry in Africa anymore. They look at me, sadly, probably thinking about how baby seals get clubbed in the head by seal abusers. They snap out of their sad memories long enough to say, “I know I should go but I haven’t been for a while.” Then they get sad again. I understand. Baby seals are so cute! I nod. Tacos are worth travelling for. They answer, “How can I read a word? What is this a practical joke?” They laugh. I don’t though, because I’m the only one allowed to tell jokes. It’s in my boss’ contract. “No I haven’t been reading the Bible much.” they admit. My mind opens up and I have a vision of demons sitting on the reps shoulder, taunting me with Del Taco green burritos hot and melty with cheddar cheese and extra green sauce. I left my wand at home so I ignore them for now. But I get it. My rep claims to be a Christian but doesn’t go to church, listen to teachers, read the Bible or share her demons’ Del Taco with me. Clearly, this is a divine appointment. I know what I have to do. I have to travel to a state with Del Taco. After all, there isn’t anything I can do for “Christians” like this. The worst part? My frakkin sandals are dusty again. “What?” said a friend? I’ll tell you. Moses warned those fleeing from Egypt against becoming like Egypt (something Solomon did.) The Psalmist said, “Some trust in chariots… I trust in the Lord.” There is a clear either-or differentiation here. Rob Bell makes the case (well) that America is an empire and as such it is all about protecting its wealth and prosperity through economic (horses) and military (chariots) might. I know that many of you won’t like this because you don’t like America to be called an empire. Yet, I know deep down inside many people actually do like to think of America as an empire. How often do we hear about how amazing our military is? How we are the only “superpower?” We take pride in it. We put our trust in it. I know many like to think of America as a Christian nation. I see this as a cake-and-eat-it-too scenario. We want to think of ourselves as holy and chosen and at the same time retain our military and economic supremacy. Just in case God doesn’t come through, or what? America is blessed. But the Bible says we are blessed to be blessing. I don’t see it. Today* both of my daughters got awards at their schools for grades and reading achievements. For Ariel’s, since Alice is away this weekend, Ben and I went to the school by ourselves. We sat way up in the middle of the stands and were extremely excited to find that Ariel would be sitting right below us a couple seats down the aisle! In front of me sat another girl. What got my attention, and what still has it even now, was how she kept turning around to stare at me; it seemed to be completely foreign to her to see a father coming to cheer on his daughter. I don’t know how to express the emptiness and joy that co-existed in her eyes simultaneously when I first told her that she had done a good job in getting a Most Improved award. I still see her eyes when I close mine. She looked at me with distrust mingled with the hope of trust. Anxiousness, like someone used to having good things taken away as soon as they accept them.She sucked up my adoration. The more she took the more I gave. Soon I realized that I wasn’t only there for my daughter but for someone else’s as well. Every time I gave her a compliment she lit up… as much as a completely reserved person can. When I called her by name she was amazed that I would care to remember it (from the award call-up.) I could tell she wanted to believe that I was proud of her but had no other evidence from her life that agreed. I asked her where her parents were and she told me that she didn’t have parents. She lives with her grandma. She said her father doesn’t come around and her mother left her when she was very young and she hasn’t seen her since. If I wouldn’t have been arrested I would have hugged that little girl as tight as I could and tell her I loved her. Oh, she needs that! I recognized this was a bigger problem than I imagined when another little girl right next to her started acting almost the same way! That’s when I got mad. Really mad. Mad at that child’s parents who left her and destroyed her sense of security and self confidence. If someone doesn’t love her and build her up – and soon – she is going to wreck her life trying to get attention. Ariel told me in the car later that she is known to get into trouble (already!) Lord, give her someone soon – don’t let her get to Middle School like this! Mad at myself for not loving on my kids enough. I sometimes see things like these award ceremonies as tedious and things that I could live without. Shame on me! That my children would feel like those little girls today for even a second would kill me! My “sacrifice” means the world to my kids! It means the world to your kids too! Mad at all the people in America and the so-called “civilized world” that act selfishly when choosing to live their lives for themselves at the expense of their children – born or not yet born. At those whom believe that divorce is an option and that our love of self trump our responsibilities. Mad that there is no ready fix for these issues! She was wearing a church camp shirt so I asked her if she went to church. She said she did. After I told her I know what its like to have my parents split up when I was young I told her I was happy that she had a church that would support her and pray for her. She nodded. I took that to mean that maybe she did and maybe she didn’t. At my church, which I love, the nursery and children’s church seem to be consistently lacking in volunteers. At my church, which I love, people sit far away from each other in the pews and visitors still don’t get greeted like they should. I don’t say this to complain! Merely to ask the introspective, humility inspiring question: If she went to my church would she get the love she needed? I said, “Of course I am!” to the other little girl and told my new best friend to have a great day. Then I went home to be haunted by the encounter. Originally posted on Facebook on May 2, 2009. Have you ever noticed that when you are trying to do something important something always comes up? Be self-controlled and alert. Your enemy the devil prowls around like a roaring lion looking for someone to devour (1 Peter 5:8). How does the Devil devour someone? With a knife and a fork, duh. So do you know anyone who has ever been devoured? Me neither. Which I guess is good because I would be sad. This is why I don’t think of animals as people. I devour animals with delight. They taste good! Thank God for animals to eat! I mean it. Animals, watermelon and potatoes are all I really need to survive. Iced Tea would come in right after that. But I could do with water. But if I cant eat an animal, watermelon and french fries today, Ill make due with cereal. I love cereal. I really love Rice Crispies. The regular kind with a little it of sugar, or the chocolate kind or the fruity kind. Man I love them. I went to Big Lots the other day and they had both fruity and Coco Crispies for less than $2 each! I bought like 15 bags. I mean it. 15. And I already had some rice crispies at home. Speaking of games. I traded a guys some Xbox Live months for Farcry 2 a couple days ago and have been playing it. I’m not sure yet if I like it so much. I know other people do. My good friend got in trouble with his wife because when she woke up to get the kids ready for school he was still playing. So if he likes it that much it must be good right? Well I’m trying it out. Pastor Ronnie recommended that I read Hood by Stephen Lawhead. I did. Its really good. It re-imagines Robin Hood and makes him cool. No men in tights. I was on Facebook today and I was checked out all the hidden eggs that you all put on peoples pages. The hidden eggs that are listed right on the front of your page. Hidden. On. The. Front. Of. Your. Page. Lame. After checking my emails, I worked on some stuff for the church. Volunteer stuff, you know. Well I guess you guys don’t know. You guys never volunteer for anything. Selfish little brats. Well maybe just the guys. Tomorrow I have to go to work. These last two days were my days off. We worked in the yard like all day yesterday. So I am tired as heck and so my days off weren’t really a restful time. Oh, but I did light the yard on fire and make my wife go get a bag of sand because she thought I was gonna start a brush fire. Funny. There are brush fires in Farcry 2. Kinda cool. You throw a grenade and if it sparks it burns everything for a minute. Weren’t we supposed to be doing something right now? Oh yeah. A devotion. I guess I got distracted. I was reading yesterday that when the Devil fails in devouring us or making God seem fake – he distracts us. What is he doing to distract you? How many people here would say that they read the Bible more than they watch TV? More than you read books? More than you watch movies or listen to music? How many people would say that you read the Bible more than all those things combined? The Word of the Lord is a lamp for us to see where we are going. How are we to see where we are going if we are overwhelmed with all these other things and we don’t have enough time for the Word? 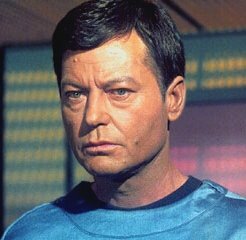 Dwen was a researcher of planetary religion who was traveling with Dr. McCoy (from the original Star Trek – you know, “Bones,” left) to speak on other planets. Spock joined McCoy and Dwen for dinner one night where Spock commented that he didn’t believe in magic or faith. Dwen said she could prove it. So she prophesied over Spock and McCoy. She prophesied that Spock would die and possibly one other person who he was close to. He wants Dwen’s sacrifice to mean something – so he decides to live in such a way as to prove that her death matters. He knows that he will never be worth her dying; he will never be able to make it up to her. But he is going to try. Dwen isn’t Jesus. But Dwen’s sacrifice echoes Jesus’. In our culture, we are surrounded by stories on TV, movies, comic books, regular books or in music where people overcome evil, change their lives for good, sacrifice themselves. You may even be one of these stories. I’m reminded of some of your personal stories on Facebook. How you overcome adversity. These stories are testimonies. They testify to something. McCoy’s pain and resolution to do right by Dwen’s sacrifice is a testimony to Dwen’s memory. It shows the reader the right way to handle pain. In other words: it lights our path. I’m not saying that pop culture stories replace the Bible. In fact I am saying just the opposite! I am saying is that sometimes we get a glimpse of something in our every day life that reminds us of God and how He wants us to live our lives. Here is the catch: we only get that glimpse if we are looking for it. When I read this Star Trek book I wasn’t expecting anything but an adventure. But when I got to the page we read just now I immediately made the connection to Jesus’ sacrifice. I was reminded of Jesus. “Whenever you break bread do it in remembrance of me.” Jesus said, in as boring and every day task such as eating, to be reminded of Him in what we do. Bread reminds us of Jesus. Drinking juice reminds us of Jesus. Star Trek reminded me of Jesus. In a normal, boring every day moment I got a glimpse of Heaven. That’s how we are asked to live out every day life – with God in mind. We may not be able to read the Bible 24×7. But we can dwell on the Word of the Lord, on His sacrifice, on His love while we do anything we do. That’s my challenge to us all today. Remember God in whatever you are doing. When I was a teen I switched parents and moved from the big city to the big mountains. Once within her grasp, my God-fearing mother wanted to undo the damage done by being exposed to sinful things and the lack of going to church that I experienced while living with my father through most of grade school. Seriously, I respect her for her zeal. Unfortunately, I only now recognize that I was placed in a situation where one set of negative influences was replaced by another. Anti-Church replaced by Anti-World. I didn’t then realize the danger. Many good Christian people spend much of their time afraid even after hearing (and no doubt memorizing that) “God is bigger than the boogie man! He’s bigger than Godzilla or the monsters on TV!” (Veggie Tales). We live a life of fear in opposition to the life of freedom from fear that Christ promised us. Jesus died so we would no longer fear death! Yet, we live afraid of music, books, movies and TV (the nefarious “media”). I remember in Youth Group, my well meaning lay leader – whom I love – made us watch a video on the evils and dangers of … Dungeons & Dragons. In the late 80’s and early 90’s Christians were afraid that D&D would lead many unsuspecting young kids into the realm of darkness and wizardry. Thanks to that video this expected epic apostasy was stopped in its tracks! Or it wasn’t something to be afraid of in the first place. You pick. Never mind the fact that I love D&D, I still wasn’t buying the idea that role playing was bad. Being creative – in essence practicing creation – echoes the Creator. How can that be bad? Only in its intent and content I would guess. I don’t know where the documentaries found their few crazy kids to use as examples, but I remember that when I got together with friends we spent most of our time battling bad guys, saving the day, and or imagining worlds where non-sense made sense. Kinda like drawing pictures, reading, writing, playing with G.I. Joe, or whatever. Do we Christians really want to equate the Old Testament with fiction? Imagining demons and devils and evil books behind every corner seems much more dangerous to our souls than role playing D&D. Harry Potter is just a book set in a fictional world where magic works. If it weren’t magic, it could just as easily be ray guns, light sabers, the force or – even – prayer. Many of my (five) readers may not like me equating prayer with magic.But the truth is we Christians have more magic in our church than Harry does in his spell book. Giving to get. Reciting words to reshape reality. How is this different from magic? It isn’t. The most obvious truthful correlation between magic and this stuff is that neither of them work. We Christians are afraid. We see the world around us and we turn inwards. We see the symptoms of the world and mistake them for the sickness. Harry Potter, TV, music, movies aren’t the cause of the diseased world. Sin is the cause. The products of the sick world will undoubtedly be touched by that sickness. But we are products of this world and we are touched by the sickness, too. Pastor Ronnie Meek this week spoke briefly of Ezekiel asking about unclean things defiling the holy. Pastor then pointed out that in the New Covenant unclean things are made holy by being touched by the holy. We should no longer be afraid of the world. We should now be the harbingers of a Kingdom about to burst on the scene. “No Fear!” should be our battle cry (if you can safely imagine it). Paul says, “Everything is permissible, but not everything is profitable.” If Harry Potter or D&D bugs you or isn’t your thing then don’t read it or play it. But don’t be quick to make your opinion into rules for others. Some of us can remain Christian and still enjoy these kinds of things. The key is fear. Don’t be afraid. What makes us different from the world isn’t that we call ourselves “Christians” or even that we try to live life by a set of morals. It’s that we aren’t afraid! We don’t even fear death. If not death then why should we fear anything? Last weekend several of us who are reading the Furnace small group book , I Sold My Soul On eBay, got together at my place for some (burned) hamburgers. During our conversation I was surprised to find that a couple people had considered not reading the book because 1) it was written by an atheist, and 2) what would they gain to hear the perspective of someone who obviously doesn’t want to be a part of our faith. I was amazed at this! I had absolutely no idea that there were even good reasons to consider not reading the book! Have you ever read the same passage of scripture and found a totally new interpretation than the last time you read it? A new, deeper understanding? Does that mean that the first time you read it you did not have the Holy Spirit guiding you in learning? Did it mean that you had it wrong and now you have it right? Of course not! That is one of the wonders of the Helper – he reveals new mercies every morning. If we had the fullness of truth the first time, then we would not need the Holy Spirit. We wouldn’t need anything. If God were that easy we wouldn’t need him. When I didn’t recognize that a different perspective existed I proved the need for the different perspective. I proved the need for community and conversation. Without it, I became one-sided. This is the kicker though: if “right” is related to the amount of truth one has, I was right. (And I still am. 🙂 But now that I am aware of the other opinion I am more right! Because I have more truth than I did before they shared with me. We may think we have it down. When we do, I pray that God stumbles us. We do not have it down; there is so much more that we don’t even recognize we don’t have. I pray we are always open to rethinking what we know and renewing our faith. It may be better and bigger than we imagine. Am I alone in this, I wonder? When I go to church, when I start to praise the Lord, as I stand for the songs, I sometimes notice that my hands feel heavy. They just sit there. What do I do with my fingers, I ask myself. I’m too tall to comfortably rest my hands on the seats in front of me. My arms are just long enough to touch them. I end up with an odd fingertip-barely-touching stance. Then I put them in my pockets. On occasion I will cross my arms. Then I see it. Well, dream it would be more correct. I think of worshiping, really worshiping – which in my mind always seems to include raising both hands to the sky in a fierce upward movement – and then light comes and washes over me. But the me I see this happening to is in front of the me that is watching the other me. I’m really just dreaming about what I could be doing. The dream is exhausting though. So I stop the dream and go back to watching the other people in the room (some of them actually living my dream). My arms are heavy and not long enough. What should I do with them, I wonder? I recently finished reading a compelling book by Rob Bell titled Velvet Elvis: Repainting the Christian Faith. Afterwards, I lent it to a friend who yesterday told me that she thought it was “dangerous.” I had to know what she meant so I asked. She said it was dangerous because the questions that Bell brought up may cause Christians to question their faith which could result in them turning away. Bell had a phrase for this kind of thinking: Brickianity. The idea that each tenant of the Christians faith was like a brick in a wall and if we pulled out one brick the whole wall would fall. I love – absolutely love! – his Brickianity illustration. And I love his conclusion: If that one brick could bring the whole thing down then how strong was the wall anyway? I would add: what is the point of defending a faith that is so indefensible? Christianity is more than our tenants and beliefs and answers and arguing. It’s more than wolves on TV masquerading as shepherds destroying our flock one by one, donation by donation, false teaching by false teaching. It’s more than 20 million dollar Crystal Cathedrals built by and for the ego of man. It’s more than word of faith, name it-claim it hocus pocus preachers knocking people down with a wave of their arm. It’s more than the insecure pastor at your church that coerced you into coming forward for an altar call. It’s more than know-it-all 19 year old internet-credentialed pastors on the sidewalk preaching doom and gloom. Christianity is more than all of this. But this is all the world knows of Christianity. I wonder at what point did our faith turn from helping others and bringing a loving Good News message of inclusion to a know-it-all, numbers driven, mega-church, seeker sensitive, exclusionary, religious-political party? When did the Queen of Sciences – Theology – abdicate her throne and turn her back on scientific truth? How did Christianity let the Conservative Right make us their lap dogs? When did truth become less important to Christians than winning? I don’t know when it happened but it definitely did. Christianity is a bad word… and it’s our fault. We set up this us-versus-them mentality. Maybe at one point in history some could argue that we needed this mentality to preserve the truth but I disagree. If early Christians survived the Caesars we can survive evolution, abortion, gay rights, liberals, Muslims and non-believers. Jesus commanded his disciples (and us) to take the good news from town to town and where it’s accepted give it, where it’s not accepted shrug our shoulders, kick the dust off our sandals and move on. Seems to me like it’s up to individuals to accept the message or not. It is not up to me! In a corporate setting we are not allowed to proselytize. (That means I can’t have an altar call in one of my team meetings. Bummer.) Today’s church is so interested in getting prayer into schools and supporting our rights to speak about Jesus anywhere that we miss the point. It’s not what we can’t do that is the issue. It’s what the other people will respond to that is key. Who wants to be preached to at work? Who wants to be forced to pray at school? Look at these things from the perspective of the unbelievers (a.k.a. the ones we are trying to share the Good News with): Christians would be outraged over a proposed law that would require our children to kneel towards Mecca – even though they didn’t have to pray; they could just meditate or take a quiet moment – at school. We would bristle at the idea that another religion is forcing themselves on us and our children. No wonder the world is so offended by Christianity! When did we become the new Caesars? After school prayer, 10 commandments at the courthouse and God in the pledge of allegiance? (Why are we supporting a pledge to a nation?!) What next? Jesus’ face on the silver dollar? Christians have confused Christianity with Americanity. It’s a false religion that destroys our ability to reach the lost, makes us look like truth ignoring buffoons, and gives the Enemy – the real one, not the sinners on this planet – so much ammunition that I am convinced he could go on vacation for 100 years and it wouldn’t get any better for us. It’s “dangerous” to think that we know it all. It’s “dangerous” to believe that what we see around us is all there is. It’s “dangerous” to think that Christianity is how God intended it. It’s “dangerous” to not ask questions and challenge and grow…and change. When we see something that needs to change we need to be up to the task. When we know that something we believe is incorrect then we need to adjust our thinking. We need to recognize that we don’t have a full understanding of God, creation or his word. We need to humble ourselves and search for the truth even if the truth is painful for us to hear. That’s what is “dangerous” about Rob Bells book. If Christianity is worthy it has nothing to fear. Truth is only ever dangerous to those who hold on to what is false. In our life we make choices, judgments, every moment of the day we are awake. We decide what to wear, what to eat, where to go, and of course whether to do something or not. Should I sit at the computer and type this or should I go to bed because it is late? Should I get a drink? What kind of drink? It’s these kinds of choices that enable us to be in control of our lives. We decided what to do and when. It’s our greatest freedom. So how do we make decisions? We do so by weighing the results of the options available. Do I want a drink? “Yes” means that I am refreshed. “No” means that I remain thirsty. So I get a drink. What kind of drink should I get? Orange juice may upset my stomach but has Vitamin C and tastes good. Water would be refreshing but is boring. Coke would keep me awake longer and tastes great but has a lot of calories. We weigh the choices and choose what best fits our needs. But what about decision making on a higher level? What about making decisions about right and wrong as opposed to mere preference? What if our preference is to do the wrong thing? Humans are flawed creatures – more likely to choose the wrong than the right. We will inerrantly choose the path of least resistance instead of what would be the right thing to do. But God calls us to a higher standard. Yes I said “higher.” As in better or best. It’s not just that God wants us to do the right thing, but it’s also that God wants us to live the right way by doing the right things every time! In fact, God asks us for 100% adherence to this rule. If we want to follow God we must do the right thing. So who makes the right thing? How do we know what the right thing is? Of course, this is where it gets tricky. The world undermines us by telling us that there are two standards for doing the right thing: theoretical and practical. “Its all well and good that we should give a tithe to the church… but in reality we can’t really afford to give 10% of our income away.” Theoretically, the world will say, we should do what God tells us to do. But practically, we must find some middle ground based on what we understand to be the situation. God isn’t concerned with whether we choose Water or Coke to drink. But there is no middle ground with God when it comes to right and wrong things – higher level decisions. Take arguments, for instance. Not every situation has two wrong participants, equally wrong, and equally at fault. At the same time two people can be wrong for different things in the same situation. Even so the wrongs of the one can never be used to justify the wrongs of the other. In God’s eyes they are both wrong for their personal choices and there is no justification. There is no middle ground or sharing the blame. Everyone is individual to God and individually responsible for their self. How can we know that something is the right thing to do and not do it? How can we know that something is the wrong thing to do and do it anyway? We need only look to our sin nature for those answers. But what of the person who says, “Who made you king who gets to decide what is right or wrong?” That’s a good question! God gave us 3500 years of written history of decisions of real people who made real bad and real good choices. God told us their stories and at the same time told us the right and wrong way they acted. Jesus came and lived on this planet to … Oh wait! This is all theoretical isn’t it? You want something practical? Who, then, decided to let me choose what is right and wrong? The Holy Spirit did. Isn’t that a can of worms? Everyone knows that those crack pots on TV think they are being led by the Holy Spirit. So how can we know the truth? My favorite verse spells it out for us: “If you hold to my teaching, you are really my disciples. Then you will know the Truth, and the Truth will set you free” (John 8:31, 32). We can only know the Truth when we actively and purposefully follow Christ. If we slip into our own religion (like many of those on TV), create our own religion, or follow no religion then we step away from the ability to know the Truth. And we ignore the Holy Spirit and his warnings and urging. We make decisions every day. How we choose to act is the most important thing we will ever do. It shows us who we are, where we are and where we are going. God says that doing the right thing for him is a spiritual act of worship! When we are presented with a choice and we choose the right path for the glory of God we are worshiping him. Our choice not to act when we know we should is an act of spiritual refusal of God. Our choices reveal who we are as well; what kind of person we are. “To thine own self be true!” Shakespeare’s Hamlet said. Shakespeare isn’t saying that we must all do what we want to. I believe he is referring to doing what we know is right and not doing what we know is wrong. The alternative is deceiving ourselves, which ultimately leads to our destruction. When we make decisions based upon what others want us to do and not on what we know to be right or wrong we lose the very essence of ourselves. This is a key to this whole issue: whose person are we? The world wants us to be our own person – which really means be the world’s person – believing that all situations have gray areas, that there is no right or wrong, just opinion and that compromise is the highest virtue. We aren’t really our own person in that situation, we are slaves to the world’s nothingness. Jesus came to save us from that nothingness and to give definition to the outlines of creation. There are rules and rights and wrongs. There are blacks and whites. Compromise is not a virtue. When we make choices Christ wants us to we become his person! And there is glorious freedom in that! Like you may have, I’ve made these kinds of right or wrong decisions and suffered the worldly backlash. I really thought that I would be respected, even if not agreed with, for being true to myself and the Truth. But the world is a lie. It tells us to do what we think is right and then hates those who do. But we can never make our decisions based upon how the world will respond to them. We have to be true to ourselves and our God. When we know something is wrong we must not do it. When we know something is right then we must act on it. Is there ever a time when it’s wrong to do the right thing? Do the external consequences ever outweigh the internal? Not according to God. There is no middle ground. God gave us all the Truth, the rights and wrongs, and the only part that we need to play in this drama is choosing which of those two choices to do. How we choose to respond tells the world, ourselves and God everything there is to know about us.